5 Reasons to experience Everest Heli Tour in Spring ~ Nepal Tibet Bhutan tour | Himalaya Holiday Services Pvt. Ltd.
Spring season, also known as the ‘King of all seasons’, is praised eternally for its beauty and warmth. Everything that seemed to have croaked during the harsh and unforgiving winter resurrects with brighter and vibrant colors. In Nepal, spring lasts throughout the months of March, April, and May. It is characterized by clear blue skies, cool breeze, and sunny days. It is also one of two peak seasons for Himalayan adventures in Nepal, and welcomes a high influx of tourists. It is also the best time of the year for Everest Base Camp Heli Tour. While trekking through the rugged trails and Sherpa villages to reach the base camp is an unforgettable journey, exploring the region from the comforts of your helicopter is a rare luxury. Flying above the towering peaks and landing at their very bases is an experience of once in a lifetime. While Heli rides to Everest are conducted throughout the year, Everest is definitely the best of all seasons. No matter the time of the year, the temperature at the summit never rises above freezing. The winters are terrifyingly cold with temperature dropping lower than -25 °C. However, spring is surprisingly pleasant even in adverse terrains like the Himalayans. The average temperature during noon reaches 12°C in daytime and lowers down to around 0°C in nighttime. This means that there are very low chances of snowfalls and avalanches, diminishing the number of risks dramatically. Also, you won’t have to layer clothes to the point that you can barely move, making your journey instantly more comfortable and convenient. Visibility is the greatest asset of the spring season. The sky is tinted with the brightest shade of blue and the sunlight reflects on the mountain perfectly. As soon as the helicopter ride begins, you can relish in the views of central mountains like Jugal and Yangra. Once you reach the Khumbu region, you will be greeted by splendid views of Everest, Mt. Cho Oyu (8,153m),Mt. Lhotse (8,501m),Nuptse (7,864m), and Mt. Pumori (7,165m). Moreover, the days are longer, and you will have seven good hours of bright sunlight. Lastly, we cannot stress enough the importance of clear visibility for air flights. Thus, from the visibility perspective, spring is the safest time. When you stop for a refuel and stroll at Lukla, at Kala Patthar for some epic sightseeing (optional), and at Everest Base Camp for an unforgettable exploration, you will come across a number of scattered, colorful tents and trekkers occupying them. While human interaction may not be a to-do in your priority list during this journey, interacting with fellow travelers and the local Sherpas can be an essential part of the whole experience. While on the surface it may seem like having small talks with random strangers, you will be able to meet, converse with, and understand the perspective of people from all walk of life. Although spring is a highly favorable time, it doesn’t see as much influx as the autumn season. During autumn, the air fares rise steeply due to high demand and you to book your flight in advance weeks before. However, in spring, there won’t be significant rise in fare. Moreover, you won’t have to worry about lack of availability of tickets or booking them months in advance. In short, you can say that, despite being a great time of the year, during spring, you won’t have to worry about ticket prices or pre-booking, making it very convenient for you. 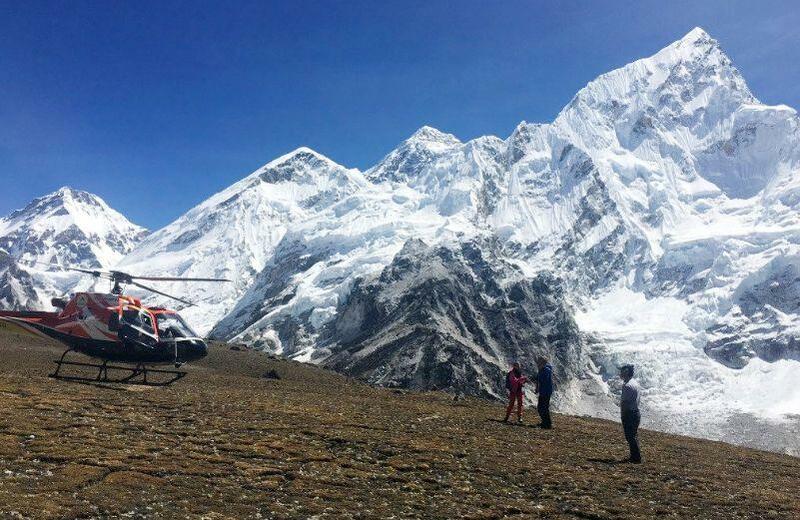 From not falling victim to unfair price hikes to flying in clear blue sky without any clouds, there are many perks of going on Everest Heli tour in spring. Both, from an environmental point of view and from economic point of view, we can conclude that sprig is the best time of the year for this experience. There are practically no chances of avalanches and snowfall that can potentially affect your journey. These are just few of many factors that make spring the most worthwhile time of the year to experience Everest Heli tour in spring.